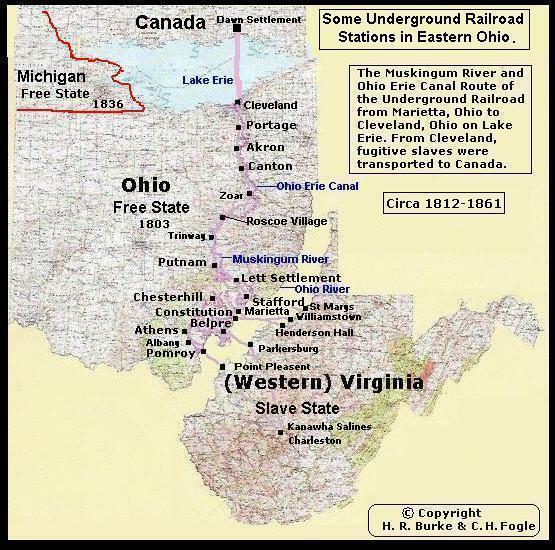 Dr. John V. Richardson Jr.
Runaway slaves entered into Ohio by crossing the 18th century Mason-Dixon Line at the Ohio River (either by swimming or ferry) from Parkersburg or other spots in Western Virginia. Notably, Henderson Hall and Blennerhassett Island Plantation were on the other side of the River. Staying away from the Muskingum River which was heavily trafficked, they entered Morgan County from Chesterhill through Pennsville (a Quaker town) and across Oil Spring Run to Triadelphia onto Deavertown and into south Zanesville, then known as Putnam. Deerfield Township played an important role due to the establishment of the county’s first Anti-Slavery Society in 1836 with forty-seven members. Confirmed conductors include T. Byres (Deerfield Township), Rial Cheadle (Windsor Township), J. Cope (Deerfield Township), William Cope (Malta Township), Affadilla Deaver (Deavertown, York Township), Thomas L. Gray (Deavertown, York Township), J. K. Jones (Deerfield Township), Martha Millions (Pennsville, Penn Township), R. Porter (Malta Township), J. Savery (Deerfield Township), Jacob W. Stansbery (Deerfield Township), Isaac Williams (Deerfield Township),Thomas Williams (Malta Township), Joseph Woodward (Deerfield Township), and William Woodward (Triadelphia, Deerfield Township). 3) Isaiah 16:3--"hide the outcasts; betray not him that wandereth. (KJV). 5) Constitution of the United States, Article 4, Section 2, Clause 2 and 3. 6) Fugitive Slave Law of [12 February] 1793 (1 Stat 302). 7) Fugitive Slave Law of [18 September] 1850 (9 Stat 462-465). 8) Putnam, David or Robert. “Underground Railroad,” *****, October 1885 to *** 1886. 9) Wilbur H. Siebert Underground Railroad Collection at the Ohio Historical Society, Columbus. Organized by State. 10) Wilbur H. Siebert, The Mysteries of Ohio’s Underground Railroads (Columbus, OH: Long’s College Book Company, 1951).